You may have noticed a few changes from the SBUSD Education Foundation. We have begun to roll out brochures, business cards and are about to embark on a website update. We have regular postings via Facebook, Twitter and Instagram which is the absolute best way to stay up to speed on what is happening. 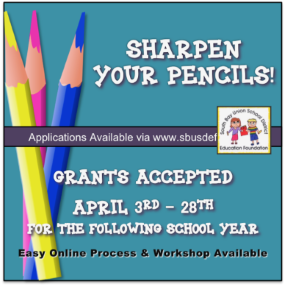 We are officially announcing that we will be accepting a round of grant applications April 3, 2017 through April 28, 2017 with funding in the fall. This schedule allows teachers to plan their activities more effectively by knowing if grants were awarded to them prior to the beginning of the new school year. We will host a one hour grant workshop and will provide informational posters at each site. Please also know that questions are always welcome via sbusdef@yahoo.com. We would love to be able to award grants to each and every site. Please apply and take advantage of informational resources! Lastly, you may have noticed that you have not received notification for a Stars Event this year. Rest assured, there will be a Stars Event possibly the next year. We are working hard to increase membership and ambassadorship. With more members we hope to continue supporting grants through fundraising efforts, community outreach, and recognition of outstanding contributors through the years at events like Stars Under the Stars.